Situated in Dhanusa district of Nepal, Janakpur is an important pilgrimage site for Hindus. The city holds an electrifying religious atmosphere. It was once the kingdom of Mithilla. The city is both historically and culturally significant. Janakpur Dham is one of the most important religious pilgrimage sites for the Hindu devotees. The place is connected to the Hindu epic the "Ramayana". Janakpur Dham is the birthplace of Janaki (Goddess Sita), daughter of King Janak. The town of Janakpurdham sprawls outwards from a concentrated mesh of houses around the world-renowned Janaki Mandir. The places of attractions at Janakpur are ponds and hermitages (also known as Kuti). There are around 72 ponds in this historical city. Among them, Ganga Sagar and Dhanush Sagar are trendy. They are located to the east of Janaki Mandir. Several other temples such as Bhootnath Mandir, Ram Mandir, Sankatmochan Mandir are equally famous in their own way. The best way to spend your days in Janakpur is to venture out of town and visit temples that lie closeby. Janaki Temple is one of the biggest temples in Nepal. It is also known as the "Nau Lakha Mandir" because the cost for the construction of the temple was about Nine Lakhs. It is a Hindu temple which used to be the palace of King Janak. Goddess Sita, daughter of King Janak was born and married to Lord Ram in Janaki Temple. Adjoined to the Janaki Mandir is Bibah Mandap, which marks the site of the divine marriage. The mandap is constructed in pagoda style of Kathmandu Valley and looks somewhat incongruous, seating right next to the magnificent Mughal-Rajput specimen of built form. Dhanush temple lies some 15 km north of Janakpurdham and is said to be the site where the bow piece that entered hell is slowly protruding out of the earth. Here you will find the most surreal and intriguing corroboration of the Ramayana. An ancient tree sits within the main temple where rock formation appear along the roots. Ram Mandir is located 5 mins away from Janaki Temple. It is one of the oldest temples in Janakpur. An idol of Lord Rama resides in the temple with other shrines. The place is quite crowded during Ram Navami as pilgrims come to pay their reverence to Lord Rama. Dhanush Sagar, a pristine pond located at a few minutes' walk from the main town center, is a great introduction to a devotee’s life in Janakpur. The pond lies opposite the Ram Mandir and is said to be the site where one-third of the broken bow landed. Dhanush Sagar is a site of daily ablutions for devotees and presents the strong bond between water and the people. Regular nocturnal Aartis are a must see while at Janakpur. Maha Gangasagar is the largest of the many ponds that dot the locality and is connected to Dhanushsagar by a channel. Locals believe that dipping in Ganga Sagar is equivalent to a dip in the actual Ganga. One of the best things about travelling to a place is to try its specific food. Don't miss to try some snacks such as Pani-puri and fresh made sweets in the market of Janakpur. A beverage that you need to is its famous sweet lassi, made using sugar, yogurt and water. Drinking this chilled drink is sure to excite your taste buds. Try the local markets of Janakpur for shopping various items. This Mithila kingdom is well known for Mithila art and culture. Mithila paintings are the best souvenir to buy at Janakpur. Shop traditional, ceramics, mirrors, printed fabrics, crafts and decorative items made by the locals. 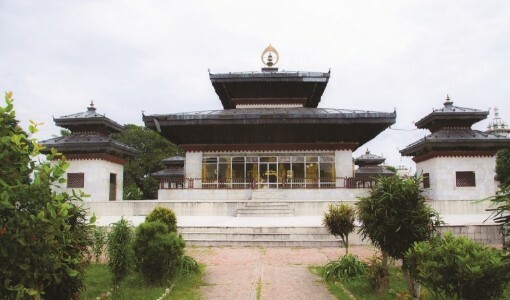 Jaleshwor is famous for the holy temple of Jaleshwarnath Mahadev. Jaleshwor is close to the Indian border. Here, you’ll find one of the most sacred Shiva temples of the region. Women from all walks of life fill the grounds of the temple during special occasions to be blessed with water from a pool that is believed to be holy. Another important place lies 18 km away from Janakpur. Dhanusha Dham is a place most visited by Hindus. It is believed that when Lord Ram broke Shiva's Dhanush (bow) into three parts, one part fell at Dhanusha Dham. You can still see the remaining part of the Dhanush encompassed by the temple. Here, the festival of Makar Sakranti is celebrated heavily every year. Devotees from several parts come and offer prayer to the Dhanusha temple. Janakpur’s culture is an infused blend from India and Nepal. Maithili language is widely spoken in the area. Nepali, Hindi, Marwari and English are other used languages. Chhath is the main festival celebrated enthusiastically in Janakpur. This puja is celebrated for 4 days and is dedicated to Sun and his wife Usha. Other widely celebrated festivals in Janakpur include Vijayadashami, Holi, Ram Navami, Makarsakranti, Vivah Panchami and Tihar. 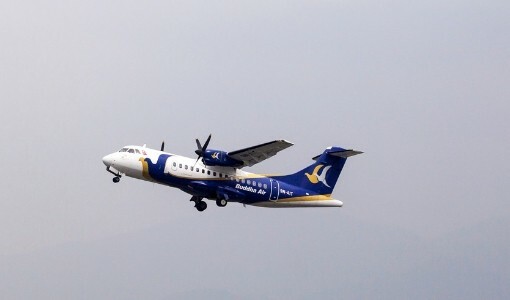 Buddha Air has daily and direct two flights from Janakpur to Kathmandu. Janakpur Airport is the sole domestic airport in Janakpur, Nepal. The duration of flight is 30 minutes. A trip to Janakpur is unlike any other you will experience in Nepal. An unforgettable religious excursion filled with spiritual experiences are memories you will cherish. © 2019 Buddha Air Pvt.Ltd. All Rights Reserved. © 2019 Buddha Air Pvt.Ltd.All rights reserved.